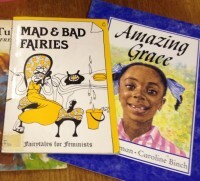 The Feminist Library has a small but core collection of multi-cultural feminist and gender busting fiction and reference books for children and young people. It all began in the 1970’s and 80’s with classics such as Whistle for Willie by Ezra Jack Keats, a gentle story of a young boy of colour, trying to whistle for his dog. The illustration makes the streets of his city look like wonderland, as seen through his eyes. Another unmatchable picture book is Amazing Grace by Mary Hoffman. The main character is a Black girl who discovers she can be anything she wants to be. Again, the illustrations by Caroline Binch are realistic and luscious and impact on the young reader. It still stands the test of time for originality now. Mad and Bad Fairies in the Fairytales for Feminists Series published in 1987, gathered together writers who respun traditional stories to empower their female characters from Irish Mythology and folklore to contemporary settings. 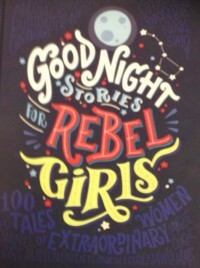 Perhaps the most inspiring, partly because of its independent crowdfunded beginnings, and also for its sumptuous book plate illustrations, is Good Night Stories for Rebel Girls by Elena Favilli and Francesca Cavallo. It contains stories of 100 women from Elizabeth I to Serena Williams and Frida Kahlo, illustrated by 60 female artists from every corner of the globe. It has inspired lots of other similarly styled books, sending the mainstream publishing world scrabbling to catch up. Aimed at slightly younger children are the Little People, Big Dreams series – small hardback picture mini biographies of inspiring women, “all of whom achieved incredible things, yet each began life as a child with a dream”. We currently have Emmeline Pankhurst and Rosa Parks from the series in the library. Emmeline was inspired by books about heroes who fought for others, as a child and Rosa, growing up in segregated Alabama, learned to stand up for herself at an early age. 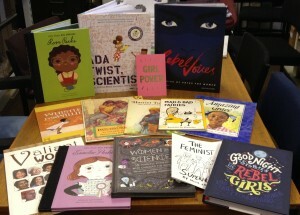 Finally, with a nod to our Feminism and Tech programme, we particularly like Women in Science, another gloriously illustrated celebration of trailblazing women in the fields of science and technology, plus Ada Twist Scientist by Andrea Beaty and fantastically illustrated by David Roberts. Be inspired and take a look at a book that may change your life.